Pregnancy is usually the time when most women become shockingly aware of how important their diet is. Not only is good nutrition important for them, but also some small, future loved one is completely dependent on their future mother’s diet for health, growth, and wellness. So what exactly do babies need need? They need a lot of essential nutrients: vitamins, fats, proteins, minerals. These all come from the mother’s regular diet, but what about when it’s not enough? What about certain nutrients that are hard to consume adequate amounts of on a daily basis? For this, there are prenatal vitamins. Lots of fat-soluble vitamins, specifically, A, D, E, and K.
Folate, from liver, legumes, beets, and greens, in order to prevent against neural tube defects that occur specifically within the first month of pregnancy. Docosahexaenoic acid, or DHA, from fish and fish oil, for brain development. Biotin, Choline, and Glycine, for nervous system, connective tissue, cognitive growth and many other functions. Most of these nutrients should come from a healthy, balanced diet, high in leafy and green vegetables, good quality meat— including organ meat, milk, seafood, eggs, and beans. There are conflicting studies about the usefulness of a prenatal vitamin if an adequate diet is being followed, but the two most important nutrients that everyone agrees should be supplemented in pregnant women are folate and Vitamin D. It is very difficult to obtain adequate levels of these two nutrients for pregnancy without supplementation. The difficulty with folate, also known as B-9, is that many women have a genetic mutation that makes it very hard for them to use it, known as an MTHFR defect. Women with this defect do not produce the enzyme used to convert synthetic folate, known as folic acid, or sometimes even natural folate from foods, into the activated form that is used in all the systems of your growing baby. It can lead to birth defects and is a frequent cause of miscarriage. Because of this, any women with an MTHFR defect (which is almost 50% of women) should take a supplement with the activated form of B-9: 5-MTHF. This is usually specified in the nutritional information on a vitamin’s label. You can be tested for this mutation at the doctor’s office, or you can just take the activated form to be sure. Finally, you want to be sure that the prenatal vitamin you are taking does not contain any harmful additives that can be transferred to your baby. There is almost no filtering between what a mother consumes and what her body delivers to the growing child, and so avoiding chemicals, preservatives, and unnecessary fillers in a prenatal vitamin is absolutely essential. 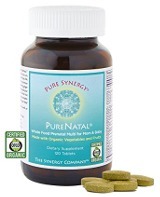 Pure Synergy Organic PureNatal Vitamin is one of the best brands available for sale. It contains a variety of different vitamins to ensure that your body is able to get the proper nutrition. And every vitamin is sourced from only organic fruits and vegetables. There are absolutely no synthetics in this formula. It is non-GMO and has no artificial colors, flavors, or preservatives. One of the best features is how sensitive this vitamin is on your body. You can take it any time of day, and either with food or on an empty stomach. It doesn’t get more convenient than that. Another great feature is its versatility. You can can take this vitamin pre-conception, during pregnancy, and after pregnancy. The container contains 120 capsules, but beware! The serving size of this vitamin is four capsules! So 120 capsules is in fact a 30-day supply. Actif Organic’s Pre-Natal Vitamin is 100% organically sourced and non-GMO. 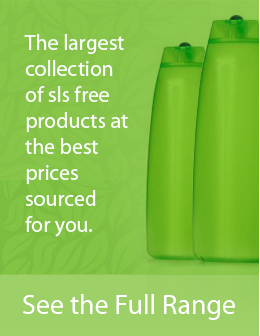 It is allergen-free and contains over 35 vitamins, minerals, and organic herbs. The formula was voted the most trusted brand by clinical doctors and specialists for two years in a row. Actif Organics contains the activated form of folic acid that can be used by any woman, with or without the MTHFR mutation, called methyl folate. It also contains a variety of Omega 3 fatty-acids for brain development, including DHA and EPA, and 100% Daily Value of Vitamin D and many others. The bottle contains 90, once-daily softgels for a full three-month supply of vitamins. It is made in the USA, colored with natural vegetable colorings, and fully digestible. If you are ready to get pregnant or already are, either of these prenatal vitamins will increase the safeness of your pregnancy and the health of your beloved child. Just make sure to follow your doctor’s advice and eat a balanced diet, and start getting ready for all of the adorable clothes and mountains of diapers.